Lin and I had a fabulous time recently getting the last of the ArtsyCrafts details all sorted out. Now the orders are streaming in, and we are finishing up kits and all the other odds and ends that go into running a smooth event. The classes are once again, a different assortment of options. I think its pretty hard to pigeonhole an ArtsyCrafts class, they have been so varied over the 5 years that we have been doing this. We do try to mix it up. Lin and I have been on a real fabric kick this year, and ironically, it does seem that many of the large crafting manufacturers are on the same wave length, I have noticed a lot of soft embellishments products coming on the scene, and some are even printing their own fabric this season! So it was pretty inevitable that this whole fabric malarkey is being reflected in a couple of our classes on offer this time. 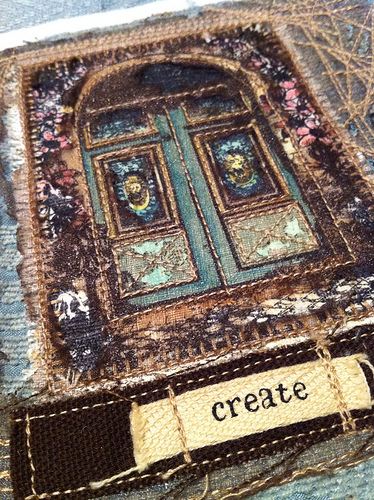 This book opens up in an unexpected way, with each page decorated with layers and layers of fabric, paper, crunchy, crackly, ribbons, flowers, washi tape, beads, buttons, charms and more. Taught over 5 teaching sessions in the day/ evening, we kick off each section with a technique, and then are on hand to help you attach and arrange the layers to the suggested template, or tweaked in a different direction depending on your level of confidence. You will have some lovely stash in your kits, to inspire your muse. You might start off a little unsure, but by the end of the day I think you'll be utterly hooked into this way of crafting, and it's so enjoyable to add carefully selected embellishments to each page. It might sound like a fabric project, but actually this is very much a mixed media affair. A double niche vintage-hinged wooden frames will end up looking like an old-fashioned book, with metal decorated cover and a clay name plate. The 2 facing niches will include many sewing-related trinkets to decorate the interior. Clay and paint is just the beginning, we also have some plaster-casting, some soft furnishings, jewellery-making skills and tissue-stamping to master, oh and a touch of UTEE. This is going to be a lovely day with plenty of fun ideas to enjoy along the way. A fascinating project, shown here in a truly masculine distressed black/ rust tones, but would also look amazing in creams and rusty brown, or even patina blues/green...the choice of course is yours. Will will accommodate your personal preference. Worked on 2 levels, inside the niche, and on top of the mesh, there a sneaky peeks through the mesh to reveal some interesting features. Paint, bespoke mica paste (yes we have developed a new technique), mica sheets, image transfers, puff paint, wire and of course rusting powder are all incorporated to get your brain whirring with the possibilities of where you could take this concept. And it doesn't stop there; clay, sheets of gold leaf, our newest product Crackly (soon to be released), and plenty of charm-ing embellishments are baked into the mix! So melt pots will be on hand too. This event is not many sleeps away, and I think we are feeling pretty organised and ready to enjoy 3 days of creativity with those of you who have booked to come along. We also have 4 new sets of fabulous brand new stamps designed by the inimitable Lynne Perrella, in her iconic style that is proving so popular with stampers. And Mark has been working on a stunning collection of haberdashery Hot Picks that we have been planning for about 18 months to fit in with this event. Lin and I have made the decision this is going to be our last ArtsyCrafts. It's been a big commitment for us putting on at least 2 events every year for the last 5 years, as well as enjoying the opportunity to host some fabulous international tutors. The whole experience has been an absolute pleasure for Lin and I. We have had so many light-bulb moments in the process while developing classes and techniques! And of course, not only have you made new friends, but you also know Lin and I (and the wider team behind the scenes) have all become firm friends in the process. I guess many of you will be disappointed we will not continue with ArtsyCrafts, but of course you will continue to see us demoing together at crafting events in the UK. Lin will launch her own new classes in the Midlands this summer, and Mark and I really need to get a lot more stuff uploaded to the too often neglected PaperArtsy you-tube channel and Blog. So we will all still be around, but more online than in-person. So a big thank-you to everyone who has ever come along to an ArtsyCrafts event. All the classes look fabulous. It must have been a real joy to create the projects. And I cannot wait to share the fun. It's come round so quick! I'll try and get to one next year... and I know I say that every time... who knows, I may actually make one, sometime! Your ArtsyCraft classes are always SO much fun, and so inspiring, all your hard work really shines through. Whaaaoooo ! I love ! But I live in France....I'm desperate ! YEAH!! !cannot wait for 3 full days of getting away from domestic goddess-ness!!! and playing with my friends!!! !